Brooke & Jane: Home Office Plans + Blog Design Giveaway!!! 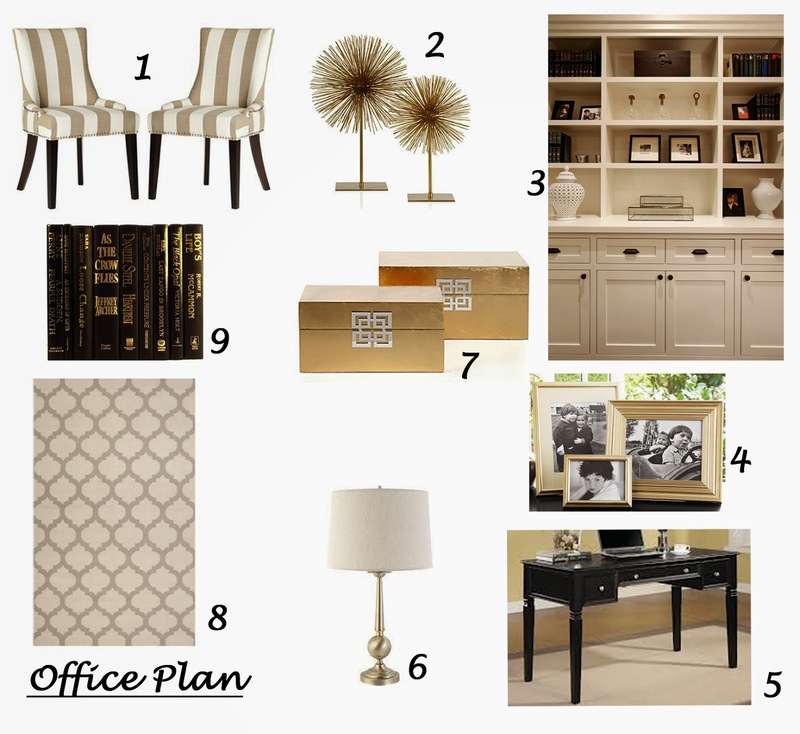 Today I'm sharing with you my design plan for my husband and I's home office. Our office is currently....well you can see its current state below, it needs help. It's the first thing that people see when they walk into our home, and unfortunately, because of all the other things you have to do to a new home (landscaping, shutters, etc. ), it's one of the last things we have chosen to decorate. I quickly realized the black bookshelf was not going to work out when I noticed that my husband and I have lots of papers, and folders, and other office things...things that aren't exactly aesthetically pleasing. So I'm finding a new home for the bookshelf somewhere else in my house, and we have decided built ins with lots of cabinets are a must. My husband works from home quite often so the space needs to be gender neutral. I'm currently in love with creams, golds, and tans, and I would definitely categorize those colors as gender neutral...so those colors are going to be front and center. I often find myself sitting on the floor in the office while talking to my husband at night so chairs like the ones below are a top priority. I still love our black desk, and it goes great with the neutral colors so it's staying. This rug is super cute and a great price. I have started experimenting with patterns, and I'm hoping the rug will go with the chairs nicely and really tie the room together! (What do you think?) And the rest of the stuff, the fluff, will consist of the below items and who knows what else. I'm excited to finish the room and show everyone the final reveal! When Danica and I were thinking about starting a blog we knew one of the keys to its success was its design. However neither Danica or I are web designers, or really good at anything else tech related... Thanks to Sweetie Baby's Designs we were able to purchase a pre-made blog design and give our ideas the perfect home! Well today we are so excited to announce that Sweetie Baby's Designs has agreed to give one lucky Brooke & Jane reader their choice of a pre-made blog design! Just enter via the Rafflecopter below, between now and Sunday night (7/20), 11:59pm mountain west time. The winner will be announced on Monday! Good luck! Great post! I am currently redoing my bedroom. Interior design can be so fun! Thanks! Interior design is so fun! Love your blog!